The three modern orders of amphibians are Anura (the frogs and toads), Urodela (the salamanders), and Apoda (the caecilians). The number of known amphibian species is approximately 7,000, of which nearly 90% are frogs. There are no known species of Caecilians in Georgia. These are a few of the amphibians you may find during your stay with us. The American Bullfrog is the largest frog in the North America. Male bullfrogs aggregate into groups called choruses. To establish social dominance within choruses, bullfrogs demonstrate various forms of aggression, especially through visual displays. Posture is a key factor in establishing social position and threatening challengers. Bullfrogs are voracious, opportunistic, ambush predators that prey on any small animal they can overpower and stuff down their throats. Bullfrog stomachs have been found to contain rodents, small reptiles, amphibians, crayfish, birds, and bats, as well as the many invertebrates, such as insects. American Green Tree Frogs are native to the Southern United States and have become an invasive species in Puerto Rico. Their bodies are usually green in shades ranging from bright yellowish-olive to lime green. The color can change depending on lighting or temperature. Because these frogs are small and easily frightened, they often do not do well with frequent handling. American green tree frogs are insectivores, usually consuming flies, mosquitoes, and other small insects such as crickets. The eastern American toad is a medium-sized toad usually ranging in size from 2.0–3.5 in. American toads require a semi-permanent freshwater pond or pool with shallow water in which to breed, to gather their water suppliers in times of drought or as a routine, and for their early development. The dwarf American toad is a smaller version of the American toad, which reaches lengths of about 2 1⁄4 in, is generally a dark reddish color ranging to light red in some specimens in isolated populations. Fowler’s toad is usually brown, grey, olive green and rust red in color with darkened warty spots. If the toad has a pale stripe on its back it is an adult. Predators of Fowler’s toad include snakes, birds, and small mammals. It uses defensive coloration to blend into its surroundings. It also secretes a noxious compound from the warts on its back. The secretion is distasteful to predators and can be lethal to small mammals. The toad is also known to play dead. Tiger salamanders grow to a typical length of 6–8 in and a maximum of 14 in in length. Adults are rarely seen in the open, and often live in burrows that are usually two feet from the surface. Tiger salamanders are almost entirely terrestrial as adults, and usually only return to the water to breed. Tiger salamanders are popular as pets. 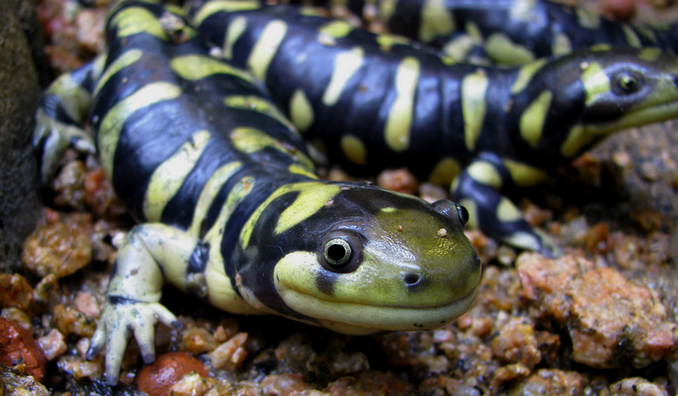 Eastern tiger salamanders are the most widely distributed salamander in North America; however the eastern population is disjunct and declining. 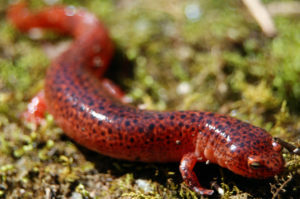 The red salamander’s skin is orange/red with random black spots. Its habitats are temperate forests, small creeks, ponds, forests, temperate shrubland, rivers, intermittent rivers, freshwater, trees springs. Overall this species is common and widespread. Pseudotriton ruber is a medium-large salamander, with adults ranging from 4.3 to 7.1 in in total length. In the Plethodontidae (lungless salamanders), many members respire through their skin and the lining in their mouths.